VICTORIA PATRICIA DAMMEYER POLAND – Private memorial services were held for Victoria Patricia Dammeyer, 95, who died Friday, Feb. 1, 2013, at her residence. She was born Feb. 10, 1917, in Youngstown, the daughter of the late Tony and Mary (Pagano) Acirelli. She was of the Roman Catholic faith and lived in the Youngstown area her whole life. 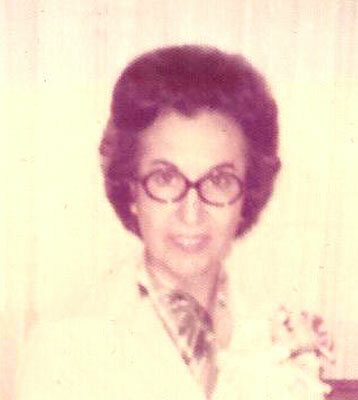 Victoria was a clerk at the main post office in Youngstown for over 16 years, retiring in 1980. Her husband of 26 years, Henry Charles Dammeyer, whom she married Jan. 2, 1950, died March 5, 1976. Victoria is survived by two daughters, Carole Ann (Joseph) Balog of Poland, and Paula (Armando) Spano of Poland; a sister, Lavern Nicolli of Youngstown; four grandchildren; and a great-granddaughter. Besides her parents and husband, Victoria was preceded in death by a sister, Helen Sabo; three brothers, Joseph Acitelli, Phillip Acitelli, and Marian Acitelli; and brother-in-law, Joseph Nicolli. There are no calling hours. The family requests that material tributes take the form of contributions to Hospice of the Valley, 5190 Market Street, Youngstown, OH 44512, in memory of Victoria.